The platform makes these heels a lot more comfortable than they seem, great for a night out! 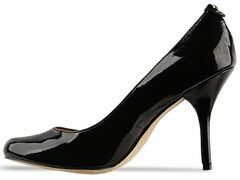 I just got these on sale and they are my new favorite, the peep toe and ankle strap are such a cute touch! I'm wearing a version of the last shoe you posted right now! I haven't worn them in years, and I decided to give them a little love today. I remember the Guess pumps--oh back in the sorority days, where we would be in them for 10+ hours and then my toe would be numb for 2 months. NOT NORMAL!